I’ve wanted to live in a castle or old mansion my entire life, just because they often have secret rooms and passageways –- you know, like Clue. Reader Beano-t must’ve been under the spell of that same desire when he built his new closet door. Beano’s building a hidden latch mechanism into the bookcase to make it even cooler, and we can’t wait to see how it all comes out. If he manages to build the latch into a tilting book he gets mad props. It’s also fun to remember that the best things in life are free. Two years from now when someone who’s never seen it comes over to his house and Beano finds a way to work around to opening the creaking secret door, the sounds of jaws dropping will most likely be heard next door. Uh, the external door hinges are a dead giveaway! Although the door hinges do give the door away, I didn’t notice them at first. The first thing I noticed was that the casing was identical to the other door. If you really wanted it to be hidden you’d have to do something about both those problems. Other than that nice job on the bookcase, good way to get some extra storage. An alternative to the tilting book would be one of those magnetic latches hidden someplace… conceal the magnet in the book, and lift it off the shelf! Just an idea. Travelling in Belgium I saw some rooms where they decorated walls with intarsia that made doors nearly impossible to discern unless you stood about 1 foot away. Not only does the hinges give it away so does the molding. The space between the floor and bookshelf shows you have something behind there. Forgot to mention – molding – the left side in the middle where the door latch is. It is a neat way of adding additional storage without taking up wall space. the space around the door will be trimmed out and painted to match. On the hinges I have some ideas… but thanks for all your comments! I like that magnet idea, and it may be more ideal than what I had in mind! I will let you know. Another method might be to actually hang a door in front of the bookcase and keep the molding as is. 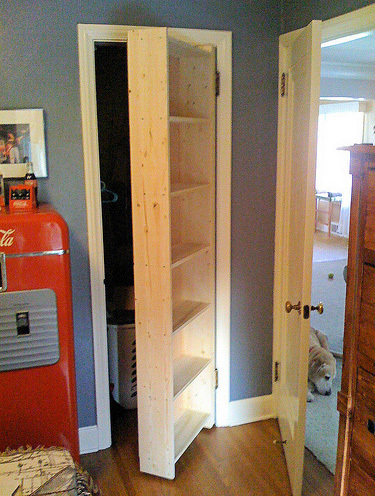 If there’s space in the hidden room, the bookcase could be hinged on the back to swing into that room rather than out. Not sure what you had in mind for the latch, but I’ve seen one of these that uses the tilted-book method. They ran a wire from the top of the book through a hole in the bookcase (normally hidden by the book). The wire passed over a pulley (used for freedom of movement) and down to a dowel. On the floor behind the bookcase was a piece of wood that was wedge-shaped like a doorstop. When the door closed, the dowel would run up the doorstop wedge and fall into place, preventing the door from being pushed open. Tilting the book would lift the dowel and allow the bookcase to be pushed open. The dowel could move freely up and down, but was restricted side-to-side by u-clamps. I really like this. closet doors always take away perfectly good wall space for shelving and the like. I now want this in every bedroom in my house (not that I have that many!). I’d be concerned about the stress of ladened shelves on the two hinges. 3 maybe? or some sort of caster under the far end of the shelf? I agree on comments about the casing. I was envisioning some sort of 1-by with some sort of spring hinge on the back so that as the door opened the casing tilted out. very cool though. I’d love to see the continued progress. thanks! It always seems to be the final touches that take the most time especially on something different. Let us see the final results. Is that an original Coke machine or a remake? Like the dog. Did he/she help any in the project? Yeah it might be nice to have a caster on the back of the shelf on the side of the door away from the hinges. Depends on what you plan to put on the shelves of course. This would look super sweet and hidden with another bookshelf on either side. I love the magnetic latch idea. I have one of these. We sorted the bottom with molding. Hinges we got none of, but rollers instead. Great idea, I love built-ins… they offer valuable space and character. Hope no one slams that shelf-door shut though! That is an original coke machine. and Tanner, yes she always helps! Here she is helping by holding that part of the carpet down. Her second favorite job next to keeping squirrels off the lawn (or keeping her food bowl empty). I saw that something like that latch you were describing and that is what In mind. Although the magnet is intriguing. you cant see it here but here is a pair of super soft rubber (no marring my floor) casters under this thing. I was worried about the weight as well. This is a great idea! Very cool. I also second the ideas above about making it concealed, if that’s what you want to do. If not, cool as is! Folks, I’m in central California, can anyone recommend someone who could build a secret room in my house for me ? I have a question, how much should the gap from the shelf to the frame be??? I know for a door, only a slight gap is required, but when it comes to wider (in depth) wood, is there a formula that tells you you have to leave x amount of gap or else the back end of the shelf when opening will hit the frame and not open? ?